Image: fcafotodigital/Getty Images. CSA Images/Mod Art Collection/Getty Images. Design: Kenzie Mastroe/SheKnows. You’ve probably been hearing the gospel of extra-virgin olive oil for years now. It’s good for everything, it seems, from greasing up a sauté pan to whipping up a salad dressing — even moisturizing skin or conditioning hair. Most of its popularity is, of course, due to its purported health benefits. According to the National Center for Biotechnology Information, it contains antioxidants, seems to reduce inflammation and may even reduce blood pressure. But extra-virgin isn’t the only olive oil on the shelf. What is up with the other forms of olive oil, and what are they good for? First of all, it’s worth noting that olive oil actually has some pretty stringent rules about quality. The International Olive Council outlines them in detail in a report from 2012, and oils are monitored for their levels of trans fat and unsaturated fat among other things. 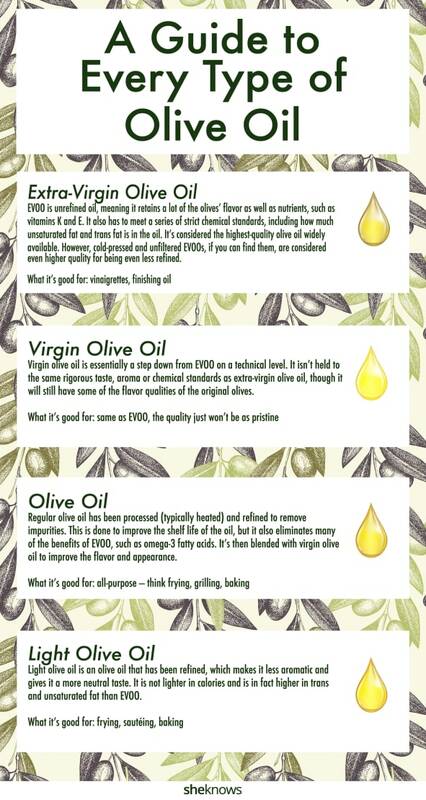 With that in mind, here's what you should know about the different types of olive oils. Extra-virgin olive oil is an unrefined oil, meaning it retains much of the flavor of olives as well as many of the nutrients, such as modest amounts of vitamins K and E. It also has to meet a series of strict chemical standards, like containing less than 0.8 grams of oleic acid (an unsaturated fat). While there has been some brouhaha over EVOO's smoke point (the point at which oil burns and releases free radicals), it's mostly been oversensationalized — you can easily cook olive oil to 405 degrees F. “Cold pressed” and “unfiltered” EVOO is considered even higher quality for being less refined, and it'll probably cost you a little more. Virgin olive oil is essentially a step down from EVOO on a technical level. It also isn’t held to as rigorous taste, aroma or chemical standards as extra-virgin olive oil, though it will still have some of the flavor qualities of the original olives. Olive oil is olive oil that has been processed (typically heated) and refined to remove impurities. This is done to improve the shelf life of the oil, but it also eliminates many of the benefits of EVOO, such as omega-3 fatty acids, and its taste. It’s then blended with virgin olive oil to improve the flavor and appearance. 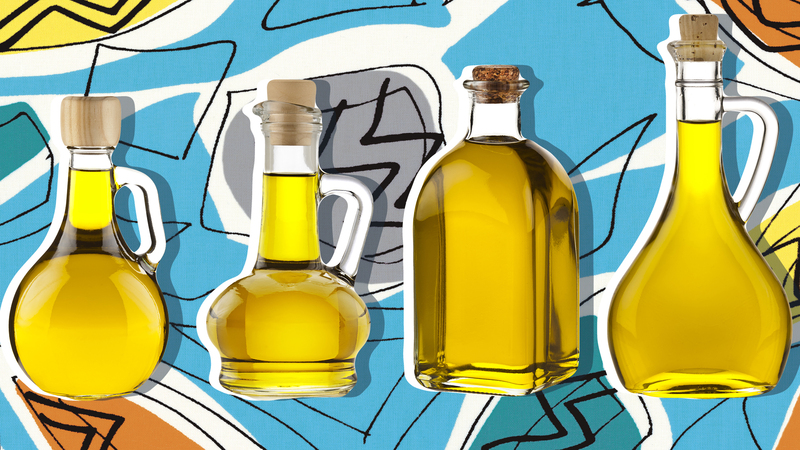 It's important to note that the more refined an oil is, the less aroma and flavor it has — but it also contains less bitterness. As oils are refined, their smoke point goes up, so if you were cooking at particularly hot temperatures, this form of olive oil may be a good choice. Light olive oil is an olive oil that has been even further refined, which makes it less aromatic, and it has a more neutral taste. If you think it's going to be lighter in calories, that is not the case. In fact, light olive oil is higher in trans and unsaturated fat than EVOO. Suffice it to say, if what you're looking for is to get healthier qualities from your olive oil, you're better off sticking with extra-virgin. If what you need is a quick oil to fry potatoes in, light olive oil will do you just fine.